Reading takes you anywhere you want to go! Takashi, a Japanese boy, is shanghaied aboard the Sindia, bound for New York from Kobe, Japan at the turn of the century. As the ship heads for Cape Horn, Takashi's love of sailing overcomes his homesickness and the hardships of a long voyage. He learns about sailing, sees wondrous sights and makes new friends...but nothing could prepare him for the climactic conclusion along the New Jersey coast. This fictional adventure is based on an actual shipwreck that occurred in 1901. The adventure continues as Takashi, stranded in America after the wreck of the Sindia finds a way back to his home in Japan. He sails to Searsport, Maine on the Lewis R. French (you can still sail on the French out of the harbour in Camden, ME) . 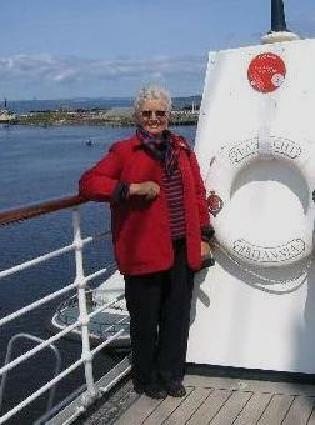 From Maine he sails to Japan on the Downeaster, Astral. In this continuation of Takashi's Voyage our plucky young hero shares customs, makes new friends, and discovers more of the world in this final leg of his voyage around the world. 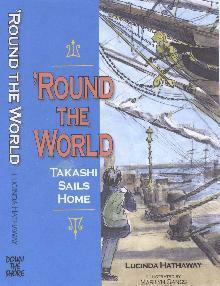 I hope you will enjoy sailing around the world with me and Takashi. Writing these two books has sailed me around the world with Takashi and my word processor. Sailing around the world has always been one of my dreams. Who knew it would turn out like this??? I believe you can learn anything you want to learn, go any place you want to go, be anybody you want to be...read, pay attention and dream. Let's go! lucindahathaway@comcast.net is my email and I read it everyday! * A talk to all the 3rd,4th, 5th grades about writing, researching and paying attention to every day storing details for future writing. * Mini-writing workshop on building a character for every 4th grade class. or I will collaborate with the teacher to design a program that fits your plan. I have visited schools in New Jersey, Maine, New York, Pennsylvania, Florida, Michigan and would love to add to this list. My dream is to go to Japan and talk to Japanese children about my hero, Takashi. "Revel in the billowing sails, the salt spray and the surge of a moving deck! 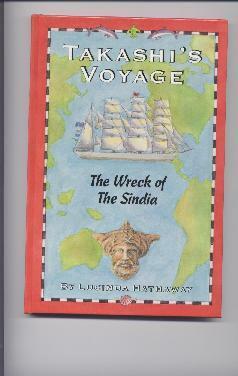 This seafaring tale is filled with challenge and discovery. 'Round the World rings with authenticity. "Frank Remkiewicz, author;illustrator of the "Horrible Harry" and "Froggy" series. "Weeks after reading the story of Takashi's predicament and being introduced into the lives of the friends who help him get back to Kobe, the sensations evoked by this richly detailed adventure will linger." Tania Aebi, first American woman and youngest person to sail around the world; author of Maiden Voyage. She is sailing around the world right now! "Lucinda Hathaway has done it again. She has spun an intriguing tale combining a seafaring Maine family and the romance of the sea and ships, with accurate historic detail." Captain Dan Pease, former owner/captain of the schooner Lewis R. French, Camden, Maine. Watercolor Journaling ~ Takashi gave me the good idea of painting and drawing in journals telling about my travels and/or my everyday life. I've been doing journals for the last 5 years and am now teaching others to journal. This summer I will be teaching Travel Journaling at the Schoodic Arts for All Festival in Winter Harbor, ME. "There is no frigate like a book To take us lands away..."
In Miss Emily's day a "frigate" was a full-rigged war ship with three or more masts all with square sails. She is correct you can go anywhere you wish to go by reading a book and using your imagination.